Blueberry crisp is always a crowd pleaser, especially when you top it with copious amounts of ice cream – vanilla, please! Do you guys ever stress about what to bring over to people’s houses, food-wise? I’m a people pleaser so I always want to bring that perfect dish that everyone will love. Mike is completely the opposite of me. His philosophy is: if you like it, they’ll like it because obviously you have good taste. I wish I could have his conviction because I’m always flipping and flopping between making something that I think is good and what everyone else will think is good. Case in point: blueberry crisp. 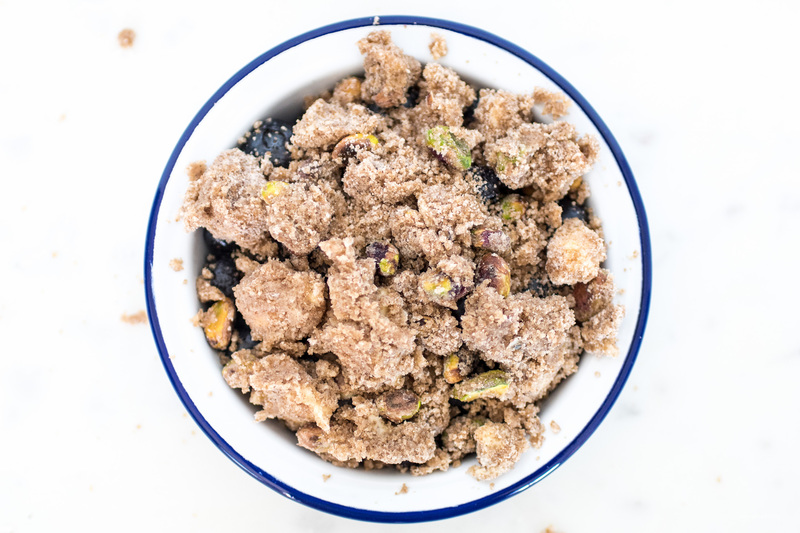 I don’t think anyone doesn’t like fresh blueberries, tossed with a bit of sugar, and topped with buttery pistachio crumble. Throw on some vanilla ice cream and you have a definite crowd pleaser, which is why I brought it over to a friend’s house the other day. I also learned that I’m allergic to cats, or at least their cat. Everything was fine at first when I was admiring him from afar. But after I picked him up for a cuddle, my face started feeling incredibly itchy. At least I’m not allergic to blueberries. Because that would be tragic. Anyway, blueberry crisp and double scoops of ice cream for everyone! 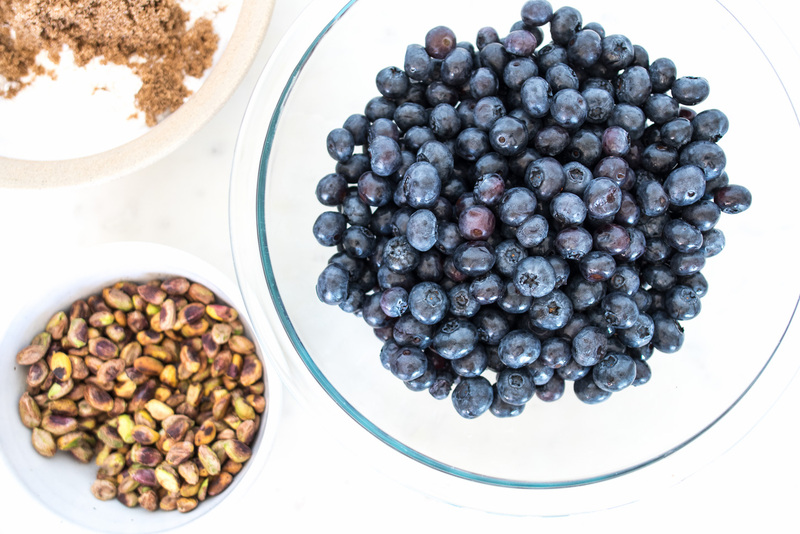 Toss the blueberries with the sugar, lemon zest, lemon juice, cornstarch and salt. Place in an ovenproof baking dish. In a bowl, whisk together the flour, sugar, cinnamon and salt. 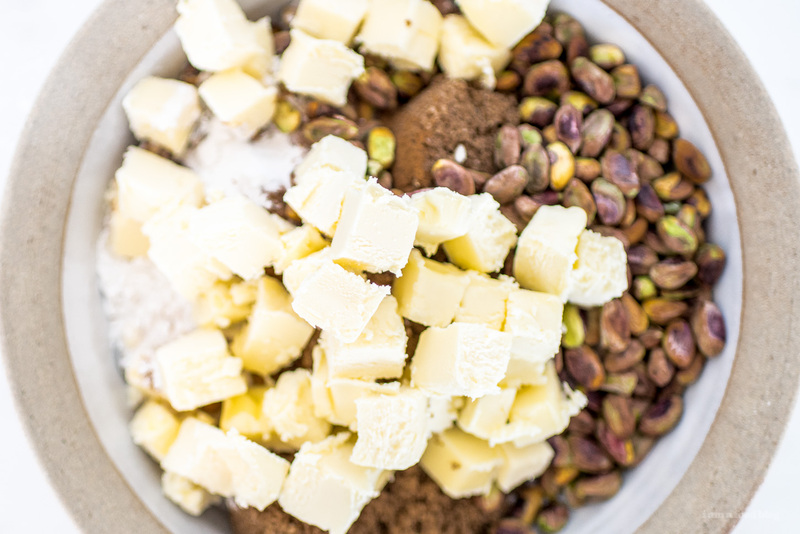 Use your fingertips to work the cold butter into the mix until it starts to clump up into crumbs. Add the chopped pistachios. Evenly spread the crumb topping over the blueberries. 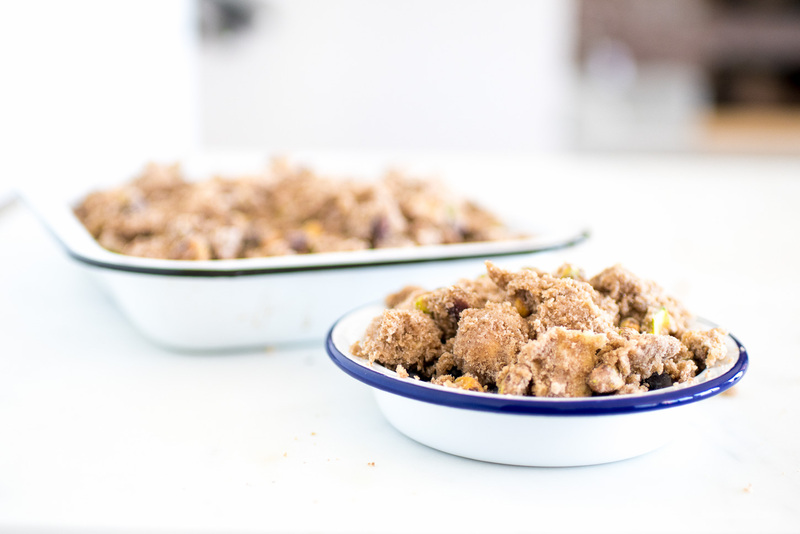 Bake the crumble for 30-35 minutes, until fruit is tender and bubbly and topping is firm and golden. Rest for 15 mins then enjoy with many scoops of ice cream. usually i’ll come up with a bunch of things that sound good to me, and then run them past my mom, who will ex-nay most of them. was going to bring a kimchi brussels sprouts dish to thanksgiving last year, but she shot that down (it’s a veryyy ohio-traditional turkey/stuffing/jello salad/mashed potatoes affair). I haven’t made or had blueberry, or any other crisp, in years. It takes me back to my childhood! Yours looks and sounds amazing! 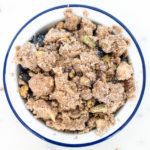 I loooooove blueberry crisp, or any crisp for that matter! And I think most people would agree! I agonize over what to bring to people’s houses. There’s like 6 different factors that I consider, including weather, what I think they’ll like, and how much grocery shopping I’m willing to do. 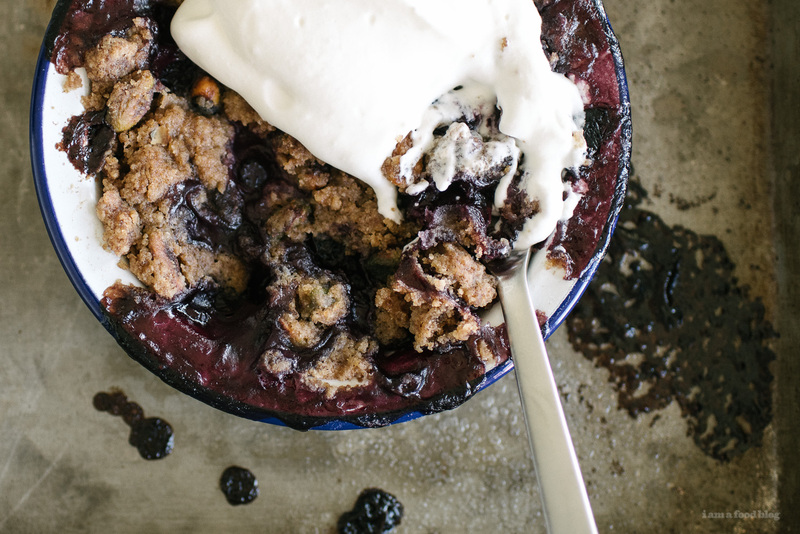 Blueberry crisp sounds like a great thing to bring for any occasion. Amazing! This looks super delicious!